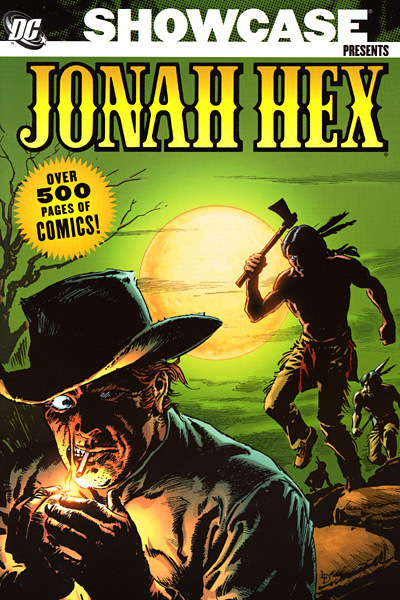 That can’t be right… according to Wikipedia, Jonah Hex made his debut in Issue 10 of All-Star Western. And there were only 11 issues in that series, so there can’t be a 12. There are non-hex stories in here, but I’ll double check on that issue 12 thing when I get home from work. yeah, it says 10, 11, 12 on the inside of the trade dress. Are you sure there wasn’t a 12th issue? Might be a mistake on the inside of the trade. Either way though, it’s the same series cause All Star turns into Weird Western. Ah, that makes sense. Dang, this thing is huge. Over 500 pages, indeed. Seeing it on the shelf, it seems pretty standard for a showcase. I like how they collect so much. Honestly though, a few of the back ups in here could have been left out without losing much. Maybe in favor of some of the newer hex stories. In any case, I’ll get into it in my review.